A metal butterfly wall décor acts as a reminder of the majestic creature's eternal beauty. It's a great way to design a garden or patio as it brings a modern, yet relaxing vibe to outdoor living spaces. Butterflies are mystifying creatures that bring color to gardens, oases, and patios. Through the addition of a metal butterfly wall décor, a timeless masterpiece, you'll be able to have the perfect outdoor accessory that appreciates the beauty and fragile form of these stunning insects. Contrary to popular belief, butterfly décor takes various designs. Determine the right metal butterfly wall décor your home needs with our buying guide. We'll also feature some of the best items we've seen to be available online that pay homage to the delicate beauty of butterflies. A metal butterfly wall décor is like the cherry on top of your sundae, which is your home. It draws the eye and it pulls the space together. If you want to make your home even more inviting, then this is a must-have for you. While there are no binding rules for adorning outdoor living spaces, following the tips we'll list down below will help when you're choosing between items that are all perfect. The one thing that you need to remember is that the perfect metal butterfly décor is the one that you actually love. If you see an item and it doesn't foster feelings of relaxation or enjoyment, then it has no place in your property. After all, it's your money that's being spent on the art piece and it's your home that you're decorating. The basic sizes of metal butterfly wall décor are the following: Oversized - An oversized wall décor measures 100 cm in length or even greater. It's important that you don't rush into buying a large item as it might not fit your space. So, get the exact measurements of your space first. Also, you need to remember that an oversized wall décor will act as the entire wall or room's focal point. Regular - A regular or medium-sized wall art measures anywhere between 60 and 70 cm. It keeps an outdoor space symmetrical especially when it's near flower beds. Small - Small butterfly home accessories look good on short walls as they're 45-59 cm in length each. They're great when they're grouped or paired. You're now ready to add artfully styled butterflies into your outdoor living space! Check out our top picks and let us know what you liked! In a stunning, color-splashed garden, you can make this wall decor the space's focal point. Best situated on top of flower beds, its glitz-inspired open design with acrylic bead accents will add glamour to your garden. Since it's wired, it will harmonize any smooth backdrop. The rusted metal finish of this butterfly wall decor gives an outdoor living space an eclectic feel. But, it also works as an indoor home decor that can give your living room a breath of fresh air and add a fun conversation piece. A simple, yet timeless art piece, it'll add color, texture, and most importantly, pizzazz to an empty wall. This Bubbly Metal / Acrylic Wall Décor from Zipcode Design can be propped up against any wall. It can be paired with an artwork or displayed alone to bring an instant breezy personality to otherwise drab walls. It lends a casual aesthetic, which means you can add this to your stylish, yet cozy living room arrangement. This 3-pc metal butterfly wall decor made of matte black iron can turn a blank wall into an interesting visual interest. Hang all three on your patio to show off your amazing sense of style. You'll be surprised how these decorative pieces can work wonders, most especially in a small outdoor space. The Iridescent Metal Butterfly Wall Décor by Wind & Weather looks great hung on an empty wall, especially outdoors where flowers are abundant. It'll make any wall insanely chic with the piece's twirling metal curlicues and iridescent paint scheme. On top of that, it's easy to install and incredibly lightweight. Whoever said you need to sacrifice style for easy installation? 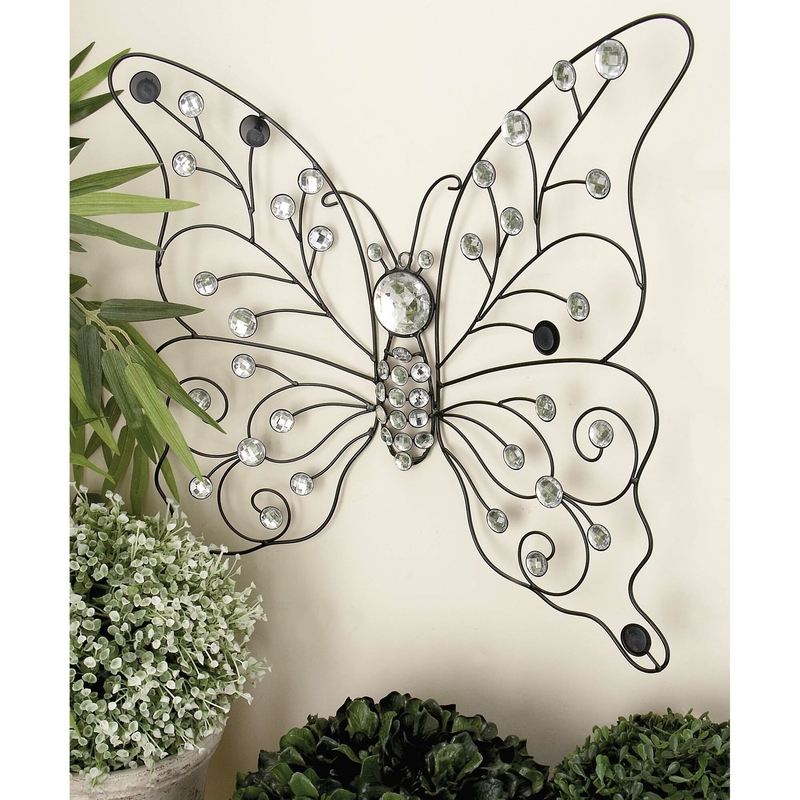 This metal butterfly with pearl art piece can turn walls into magical displays in seconds! It's capable of filling oddly shaped walls with character and color with its brown and silver finish. It's a favorite among homeowners (yes, that includes us) as it livens a room up without overwhelming the space. Anything from Wind & Weather makes you appreciate the beauty of nature including this Metal Butterflies on Branches Wall Décor. It's a reminder of summer wherein the flowers are in full bloom and butterflies glide past clusters of flowers. With the 4 multi-colored butterflies handcrafted from recycled metal, this bold wall art infuses white walls with enough character and color. This piece from August Grove comes with a varied-color traditional pierced design. The stunning butterfly cutouts climb on a vine wall structure, making the entire piece a charming wall decor that's as chic as it is traditional. Adorn your wall with this eye-catching artwork for a unique statement piece. The last work of art on our list of the best metal butterfly wall decor is a framed one. Its textured metalwork is paired with Mother of Pearl and hand-painted details. It can be hung both indoors and outdoors to provide a burst of texture and color to a living space. You'd be glad to know that it's compatible with almost any type of surface.